The Reverse Advent Calendar campaign is returning for a second year, after a hugely successful first run last Christmas. Green Party of England and Wales co-leader Jonathan Bartley visited Brighton to launch this year's campaign alongside MP Caroline Lucas and the local Greens. The charities which the Reverse Advent Calendar will support this year are: Brighton Women's Centre, Voices in Exile, Whitehawk Food Bank, Off The Fence, and Bevendean Food bank. Britain's largest food bank charity, The Trussell Trust, has said it is expecting its busiest month ever in the run up to Christmas, with more and more families finding themselves unable to afford their basic needs. 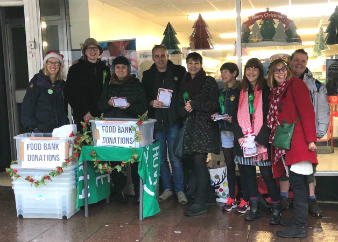 "Last Christmas we asked local residents across Brighton and Hove for donations of food, clothes and toiletries to support those most in need at Christmas, and the response was overwhelming. Sadly, we are a year on and there are still so many in need of support. "So this year we are running the Reverse Advent Calendar campaign once again, working with more fantastic charities in the city. "We must continue to fight for a future where no one has to use a food bank, but in the meantime, there are small things we can do that make a big difference. "At this time of year it is vital that we come together to support those most vulnerable in our communities. "If you can spare anything at all for those in need this Christmas – please be part of our campaign." As well as the homeless, the charities receiving donations from this year's campaign will support refugees, asylum seekers and vulnerable women.